The Medicinal Plant Research Program has two major areas of research: Botanicals and Human Health and Medicinal Plants as Alternative Crops. The goal of the Botanicals and Human Health Program is to identify botanical products with the potential to improve human health and to enable the safe, effective and proper use of high quality botanical products by healthcare professionals and consumers. Consumer health products based directly on plant and minimally-processed plant products, known as herbal products, botanicals, dietary supplements, phytomedicines, or nutraceuticals have recently shown a rapid sales growth in the U.S. Unfortunately, the quality of the products that are in the marketplace is highly variable and neither the consumer nor the healthcare professional is able to distinguish between high and low quality products. The Center’s scientists believe that good science is needed to provide information needed by the public to make good decisions concerning the proper use of these products. The Botanicals and Human Health Program includes both research and educational activities. 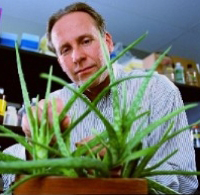 Research projects focus on enhancing product quality and safety through botanical, pharmacological, chemical and agronomic characterization of botanical products, and the discovery of new botanical products. Current projects that focus on enhancing product quality and safety include working with the Food and Drug Administration to develop a model for bioactive constituents, degradation products, and contaminants; and working with USDA on the use of genetic profiling to certify authenticity of seeds and plant specimens. The Center’s comprehensive approach for the development of new botanical products relies on traditional use and ethnobotanical information to identify leads, a battery of biological assays (cellular, biochemical and molecular) to detect biological activity and chemical standardization technologies. The Center’s botanical research program starts with gathering, assessing, and cataloging literature regarding traditional uses of botanicals throughout the world. This information is reviewed to identify lead candidates for new product research. Much of the controversy surrounding existing literature on botanicals results from inadequate research aimed at ensuring quality plant material that has been authenticated botanically and characterized chemically and pharmacologically. The Center’s research program includes sample authentication, analytical and biological characterization, and standardization activities. Research is also conducted on the optimization of yields of desirable bioactive constituents in plants. Current projects include identification and development of botanicals with antioxidant, immunostimulatory and anti-inflammatory activities. Educational activities include providing practical information on botanical products to healthcare professionals, government officials and consumers, and conducting market research studies to understand what healthcare professionals and consumers know and don’t know about botanical products, how healthcare professionals and consumers use botanical products, and to identify supply chain issues that are unique to manufacturing and distributing botanical products. Scientists in the Center and the academic departments of the School of Pharmacy are involved in continuing education programs for pharmacists, physicians and other healthcare professionals, and serve on advisory committees to the FDA, the National Institutes of Health (NIH), the United States Pharmacopoeia (USP) and industry trade associations. The goal of the Medicinal Plants as Alternative Crops Program is to conduct research that can be used to develop medicinal plants as high value alternative crops for U.S. farmers. Research focuses on identifying medicinal plants that are viable economic opportunities for farmers and on correlating cultivation, harvesting and agronomic conditions to the plant’s ability to produce the desired chemical and pharmacological profile. Environmental chambers are used to simulate different growing conditions and experimental plots are grown at the Center’s Medicinal Plant Garden. Other research activities include determining the optimal post-harvest processes to maximize desirable properties, genetic engineering, crop improvement studies, and translational research and marketing research. Current projects include economical production of podophyllotoxin, an important intermediate in the synthesis of anticancer agents, agronomic potential of medicinal plants in Mississippi, value-added development of botanicals through harvest, post-harvest and storage practices, and market research to quantify commercial potential.